sell office chairs, executive desks, conference tables, office cubicles, and workstations. This Broward County city is the epitome of the Florida seaside dream, and it is a fantastic place to run a business. We are proud to serve the community, and we will be here to help any time you need new or used office furniture in Nurmi Isles, Sunrise, Harbor Beach, Rio Vista Isles, or any other part of Fort Lauderdale, Florida. Executive desks are one of our specialties, and you have a wide variety to choose from when you work with our company. 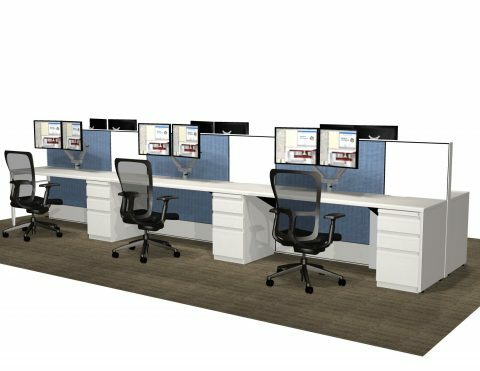 We are also highly regarded for our re-manufactured workstations, and we have office cubicles of all sizes in our inventory. Of course, we carry an extensive line of office chairs to satisfy the needs of any business, including state-of-the-art ergonomically optimized chairs. In addition to the office chairs, we offer guest chairs for waiting rooms, portable folding chairs, barstools, and more. If you just want to pick out specific pieces of used office furniture for your Fort Lauderdale, Florida business, you can certainly do so. However, we provide total space planning and design solutions for our clients free of charge. We can evaluate the layout of your space, gain an understanding of your needs, and apprise you of your options. Ultimately, we can implement the plan and handle all of the installation tasks for you, so we are truly turnkey resource for businesses of any size or scope. We know that you have options when it comes to used office furniture, office cubicles, and remanufactured workstations. Here at Direct Office Solutions, we go the extra mile to provide a world-class customer experience, and it all starts from the first moment that you get in touch with us. Our team members are polite, communicative professionals who will make sure that you get exactly what you need at a price that won’t put a strain on your budget. If you would like to speak with one of our Fort Lauderdale, Florida office furniture consultants, give us a call right now at 954-440-4410.